It was a shock to receive word on Saturday morning that Icelandic composer Johann Johannsson had been found dead in his Berlin apartment. 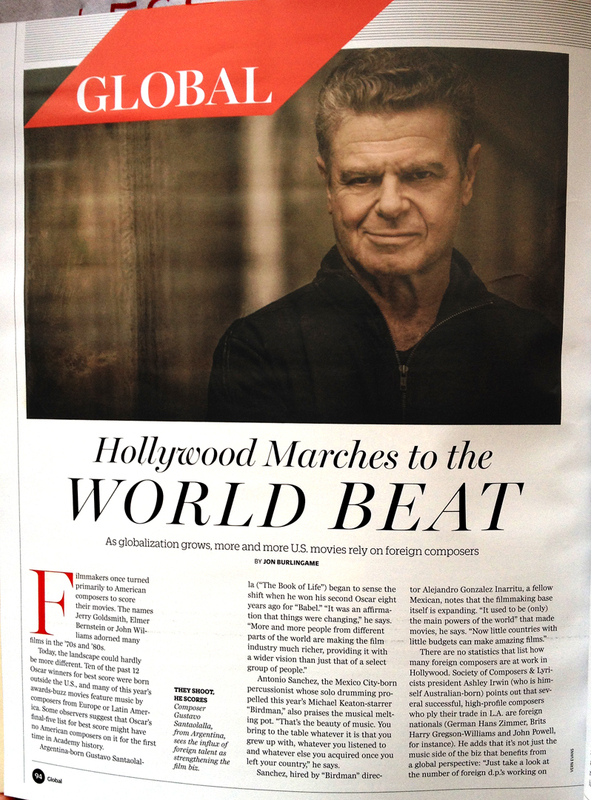 As Variety‘s resident film-music writer, it was my sad duty to talk with his manager and write the story as quickly as possible. Here is that obituary. I had known him since his Oscar nomination for The Theory of Everything (the photograph of us is from a post-screening Q&A we did together in early 2015; our first interview was in late 2014) and we did a fascinating interview in late 2016 for the Directors Guild magazine that also included his longtime collaborator Denis Villeneuve; that story is here. I was a great admirer of his scores for Sicario (Oscar nominated in 2015) and Arrival (unfortunately disqualified for Oscar consideration in 2016; here is the full explanation of that). It’s been a tremendous loss for the film-music community, and the days since his death have seen an outpouring of emotion. 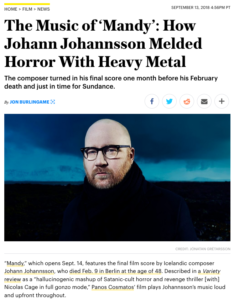 This entry was posted in Composers, Film Music, Interviews, Obituaries and tagged Arrival, Johann Johannsson, Johannsson music, Johannsson obituary, Oscar disqualification, Sicario, Theory of Everything, Variety on February 12, 2018 by Jon Burlingame. I thought that Johann Johannsson’s music for Arrival was one of this year’s most interesting and creative film scores — yet the use of Max Richter’s 12-year-old classical piece “On the Nature of Daylight” (which bookends the film) was startling in terms of its stylistic differences. So it came as no surprise that the Academy of Motion Picture Arts & Sciences’ music-branch executive committee disqualified the entire score from consideration in this year’s Oscar race. Having interviewed both Johannsson and Richter about their music earlier in the awards season, I thought it might be instructive to hear what each had to say about the use of this “temp music” in the final version of Arrival. I also talked, on background, to members of the committee who made this decision. 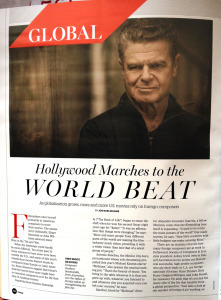 This entry was posted in Composers, Film Music, Interviews and tagged Academy music branch, Arrival, Film Music Society, Johann Johannsson, Max Richter, On the Nature of Daylight, Oscar music controversy, Oscar music disqualification on December 20, 2016 by Jon Burlingame. One of the year’s most interesting musical scores, for the sci-fi film Arrival, was the result of a close collaboration between Icelandic composer Johann Johannsson and Canadian director Denis Villeneuve, whose previous films Prisoners and Sicario were also notable for their music. DGA Quarterly editor Steve Chagollan asked me to get both on the phone (Johannsson in New York, Villeneuve in Budapest where he is shooting Blade Runner 2049) to discuss the details of Arrival and, more generally, their long and artistically fruitful partnership. The story appears in the fall/winter 2016-17 issue. 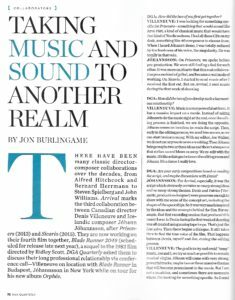 This entry was posted in Composers, Film Music, Interviews and tagged Arrival, composer-director collaboration, Denis Villeneuve, DGA Quarterly, fall 2016 DGA Quarterly, Johann Johannsson, Sicario, Steve Chagollan on December 16, 2016 by Jon Burlingame. For one of its awards-related special end-of-year issues, Variety asked me to inquire of this year’s crop of potential score honorees about the challenges they face in a changing environment for composers in film. It was an interesting assignment, and I asked Johann Johannsson (Arrival), James Newton Howard (Fantastic Beasts), John Debney (The Jungle Book), Nicholas Britell (Moonlight), Alan Silvestri (Allied) and John Williams (The BFG) about time to compose, budgets, temp tracks, synth mockups and the controversial new practice of “striping” (recording different sections of the orchestra separately from one another). This entry was posted in Composers, Film Music, Interviews and tagged Alan Silvestri, challenges for film composers, James Newton Howard, Johann Johannsson, John Debney, John Williams, Nicholas Britell, Variety on December 13, 2016 by Jon Burlingame. 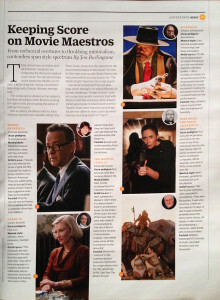 The top story in this week’s special music edition of Variety deals with music for science-fiction films. Arrival — about learning to communicate with alien visitors — is already much-talked-about, and Johann Johannsson’s fascinating, voice-based score is widely considered a strong candidate for awards. 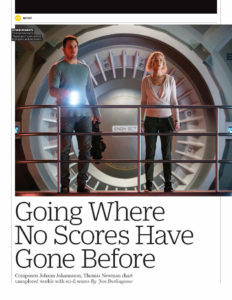 Passengers, which hasn’t yet opened, is sure to be much-discussed, too, and Thomas Newman’s music combines traditional orchestra and contemporary electronics in ways that only Newman can. 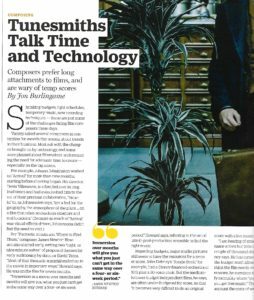 I talked at length to both composers for this story, one of four I’ve written examining music in 2016 movies. This entry was posted in Composers, Film Music, Interviews and tagged Arrival, Johann Johannsson, music in science fiction movies, Passengers, science fiction movies, Thomas Newman, Variety on December 3, 2016 by Jon Burlingame. The Society of Composers & Lyricists screened The Theory of Everything last night for its members at the London Hotel in West Hollywood. 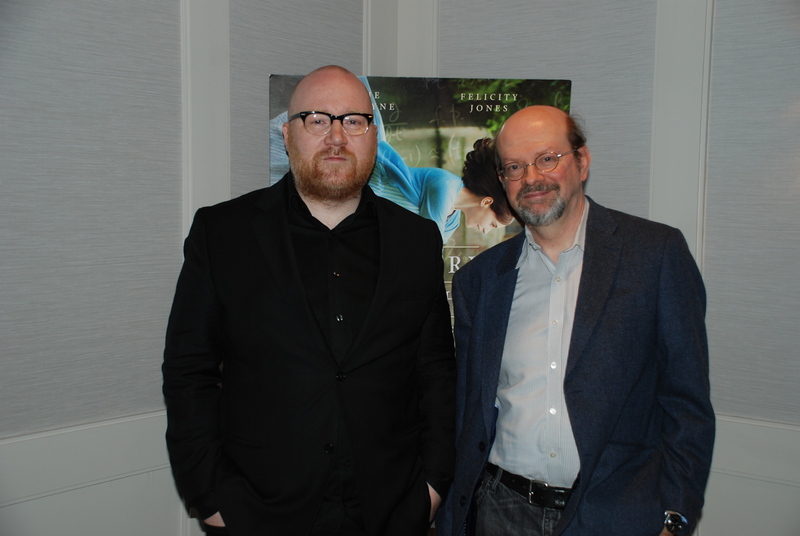 After the screening, I interviewed Johann Johannsson, the Icelandic composer who has already won a Golden Globe and is now up for an Oscar for his largely piano-and-strings score. He gave us a great 45-minute interview, providing insight into his musical choices for the Stephen Hawking biopic. This entry was posted in and tagged Johann Johannsson, Society of Composers & Lyricists, The Theory of Everything on February 3, 2015 by Jon Burlingame.